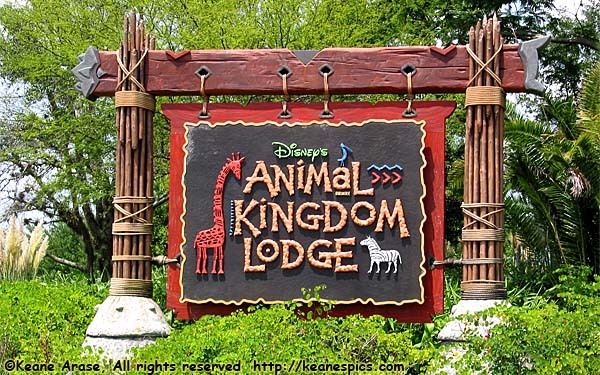 Animal Kingdom Lodge (AKL) made its debut in April 2001, three years after Animal Kingdom opened. The theme of this place, modeled after one of the premier attractions in Animal Kingdom, is supposed to be a game lodge in Africa. I wonder how many game lodges in Africa are six stories tall with over a thousand rooms? (I also doubt that the lodges in Africa have perfectly manicured thatched roofs, either. At least ones made out of plastic covered wire.) But I'm not sure that's the point. The popularity of the theme of the resort prompted the Disney Vacation Club in October 2006 to build a sister resort next to the first. This new resort, named Kidani Village, partially opened by May 2009, and fully opened in September the same year. The original Animal Kingdom Lodge was renamed Jambo House, and both would exist under the umbrella name Animal Kingdom Lodge. Sort of like how Riverside and French Quarter gets umbrella'd under the name Port Orleans. Got it? Kidani Village would add 50% more rooms to AKL (1500 total), but would double the size of the resort. At the same time, a number of normal rooms at Jambo House would be converted to Deluxe Villas. Animal Kingdom Lodge (AKL) is admittedly, my favorite place to stay at Disneyworld. It isn't unique due to its themeing (though it's pretty darned good themeing), but as much due to the fact part of its themeing consists of live animals. And I don't mean humans. There are four separate savannas here. Two unique to Jambo (Arusha and Uzima), one unique to Kidani (Pembe Savanna) and one is shared between the two hotels (the largest, Sunset Savanna). They hold more than a hundred different animals. Each has its own set of animals, and if you're visiting, you should see more than one. Until 2011, I had a policy to stay at a different resort every trip, except for AKL. Then due to circumstances (and frequent trips), that policy broke down, but I digress. My stays at what is now known as Jambo House were in April 2003, May 2004 and December 2006, all savanna view rooms. I've stayed twice at Kidani, in December 2009 in a Studio Villa, and in March 2012 in a handicap 2-bedroom villa. The entire resort is done up in earth tones, dark reds, browns and greens, and is kept somewhat dark due to the themeing. From authentic African art to the animal savannas, the resorts are an attraction in itself, and can easily take a half-day to a day to explore. It is possible to walk between Jambo and Kidani, but it's quite a walk, depending on where your starting point is and where your ending point is. It's triple the distance from say, Mara in Jambo to one of the rooms near Pumbaa elevator in Kidani versus one of the far rooms in the North wing. The two resorts also share buses. All theme and water park buses stop at Kidani first, Jambo second. The Downtown Disney bus reverses this. Plusses: More animal viewing areas. Better food options. Better gift shop. Boma. Minuses: More crowded, larger resort. Second stop on the theme park bus route. Pluses: Newness. Under building parking. More African artifacts. All villas. Better pool area. More refined themeing. Sanaa. Minuses: No breakfast options. Needs a food court. End Animal Kingdom Lodge - Overview.